Henry Ford was born on a farm near Detroit, Michigan. He never really enjoyed farming and left the farm at age sixteen, three years after his mother died. As a child he was fascinated by machines. He always carried around in his pockets nuts and bolts and machinery parts. By the time he was thirteen he could put together a watch that kept time. This interest in machines led him to work for a while as an apprentice machinist, and later he went to work for Westinghouse servicing their steam engines. Clara Bryant became his wife in 1888. He returned to the farm, built a house, and ran a sawmill. They had one child, a son they named Edsel. When Henry was twenty-eight he became an engineer at Edison Company which made electrical generating stations. He was made chief engineer two years later and advanced to a salary of $125 a month. 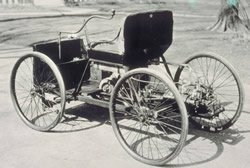 The first car he made was a "gasoline buggy" called the Quadricycle. He drove it around for two years, and it drew a crowd everywhere he went. In 1903 he built two race cars to advertise the automobile. One he named the "999" and the other the "Arrow". He hired Barney Oldfield, a professional bicycle rider and race car driver to race for him. In 1904 Ford himself driving the Ford Arrow set a new land speed record in his car - over 91 miles per hour! The event took place on the frozen ice of Lake St. Clair. 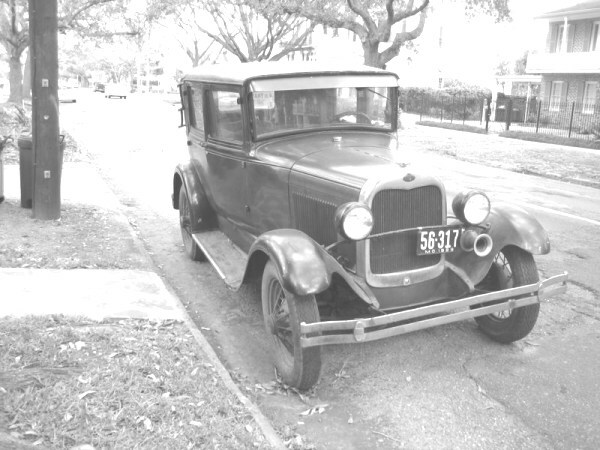 When he was forty years old Ford and eleven investors formed the Ford Motor Company. They had a $28,000 investment in it. 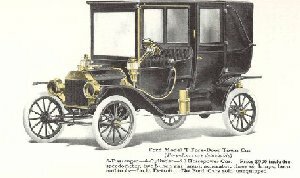 The Model T Ford was introduced on October 1, 1908. Some called it the "Tin Lizzie" and the "Flivver". The cost of the touring car: $950. Five years later he started using an assembly line and could produce cars faster and cheaper until the price of the touring car fell to $360. Assembly lines had been used before, but he was the first to use conveyor* belts to move the parts where they needed them. The 1912 Model T Ford touring car included such extras as oil lamps, horn, speedometer, and tools. Henry Ford's motto was "simplicity". 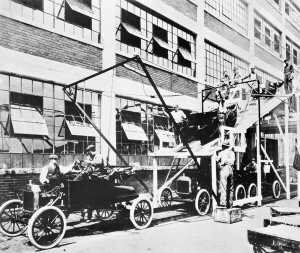 * By simplifying the process of making cars, he was able to make the car affordable to the common worker in America. Of course, this simplification resulted in only one color choice. He wrote, "A customer can have a car painted any colour that he wants - so long as it is black." In his book he contrasts the making of axe handles by hand and machine to show how mechanization* reduced the cost of his car. Ford hired handicapped workers. * He studied the jobs and the requirements and put each man in a place where he could do the job and make a living for his family. 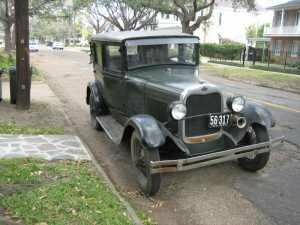 Sales lagged in the 1920's as other car makers offered more options and financing. He and his son Edsel designed a new car, the Model A.
Ford was a firm believer in the idea that the able-bodied should work. He thought as an employer his job was to serve others. He paid his workers $5 a day. This was nearly twice as much as most employers paid their employees. He felt there was something sacred about wages and what they represent. He instituted the 40 hour week with men working eight hours a day, five days a week. He had a code of conduct for his employees which forbade heavy drinking and gambling. His company also made airplanes for a few years. One, a twelve passenger plane, was called the "Tin Goose". He produced tractors to help the farmer to farm more efficiently. Ford developed an interest in plastics made from soybeans. He worked with George Washington Carver on the research. He even made a plastic car that could withstand heavy blows even better than steel. However, it was never successful. Ford had a heart attack in 1938 and turned the running of the company over to his son, but Edsel died five years later, and Ford had to again assume leadership. He stayed in that position for two years, but due to his ill health, he made his grandson Henry Ford II president of the company in 1945. 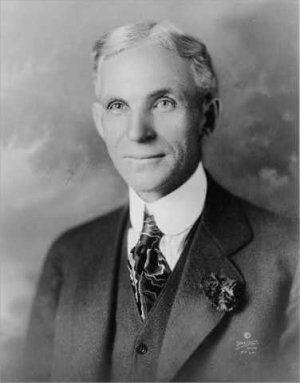 Henry Ford died at the age of 83 of a cerebral* hemorrhage. * He was one of many people who helped to make America great. At the end of his book he describes his vision of a great country in which the resources of a country and the skills of its people are developed so that all have a fair share. The following article, "HENRY FORD ON HIS PLANS AND HIS PHILOSOPHY", appeared in the Literary Digest January 7, 1928. The pictures will take you to pages where you can enlarge the picture twice and read the article. excerpt from a book published by John Wiley & Sons, Inc.
At biography.com search for Henry Ford. Scroll the panel for the "Video & Audio Results"
Excellent information...Lake St. Clair is spelled incorrectly though. Thanks, I removed the e and fixed it. I loved this page. My 7 year old son has to do a book report and we were snowed in this weekend and didnt have a way to make it to the library and today everything is practically shut down. Your website is easy to read and informative and has all the right information for a 7 year old to read and understand. This page displayed 228,770 times.